At CNP Signs & Graphics we don’t play golf for fun – we do it for charity. Each year, two of our clients Jack in the Box and IN-N-OUT sponsor major charity golf tournaments, and we are more than happy to attend. Anything for the kids! In addition to displaying our stunning golf prowess, CNP Signs & Graphics also donates to the live auction at each event. This year we were excited to team up with Burton Snowboards to create custom snowboards for the events. These amazing custom Series 13 boards, designed by Art Director Andy Wright, were handcrafted for each charity at the Burton Manufacturing Center and donated by CNP. The Jack in the Box Charity tournament, held last week, benefited Big Brothers Big Sisters through the Jack in the Box foundation. 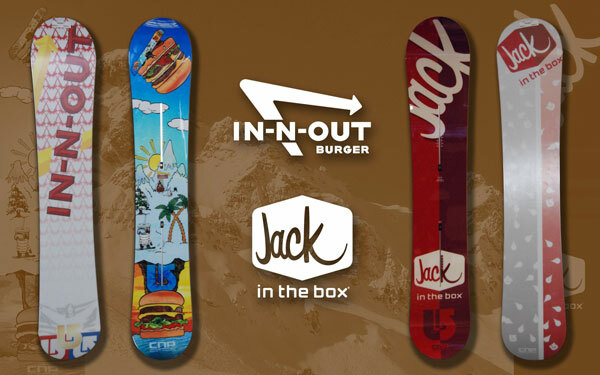 For the Jack in the Box snowboard we decided on a clean, modern look in keeping with their new logo and color palate. The front of the board featured the new Jack in the Box logo and the back of the board has a mixture of design elements in keeping with the Jack in the Box theme. Later this month CNP’s finest will attend The IN-N-OUT Burger Foundation tournament which was started by the Snyder family to raise money to help prevent child abuse and neglect. Andy designed the front of this custom snowboard with a modern cartoon look using digital and illustration art. The back of the board utilized the IN-N-OUT logo and signature cross palms. During the completion of this project we were notified that these snowboards would be the last two custom designed boards made in the Burton US factory. I guess when you’ve made the best, you can forget the rest. FORE! !